Brings true sub-microlitre droplet measurement of biological samples to every life science laboratory. From the inventors of the original droplet measuring spectrophotometer comes the next generation of compact mobile device utilising SmartPath™ Technology. 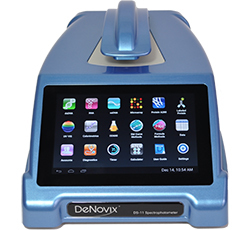 The DS-11 takes the world of microvolume spectrophotometry to a whole new level. Its compact, stand-alone design allows it to operate without a PC and does not require any software installation. Just turn it on and it’s ready to go. Busy labs will love the four second measurements and the time-saving AutoRun function. You’ll also love the choice of three attractive colours. No PC required, no software installation necessary – just switch on and go!